Tell us about your favorite childhood meal — the one that was always a treat. That meant “celebration,” or that comforted you and has deep roots in your memory. Again I am going to change the parameters of this challenge, as my blog is all about 2014. But I also want to say at the outset, and to strengthen my anti-childhood memory stance. 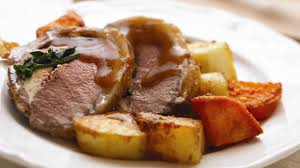 It was lousy back there: Food in late 1950s and early 1960s in Perth working class post war re-patronized suburbs was very conservative: Lamb roasts, baked potatoes and two veges – usually lamb with peas and carrots. Oh, and what about that dreadful pumpkin baked with orange juice my Nanna used to make. Fish and chips an essential Friday catholic thing. My mother did a Continental cookery class at night classes down the hill at Tuart Hill High School to learn how to prepare the wonderful new things Italian and Greek immigrants were bringing into the country. But I want to move forward, a whole generation and a new –ism (multiculturalism). Instead of remembering the world of a 14 year old I am going to focus on 2014. Being on the road in 2014 has been imbibed with a necessity for simplicity, pasta and stir through sauce. Fish and Chips (see other blog entries about this challenge) Soup and toast. Grilled meat and a salad which might depending upon what is in the larder sometimes only sliced tomatoes with artful seasoning (sachets of salt and pepper released from a MacDonald’s restaurant). 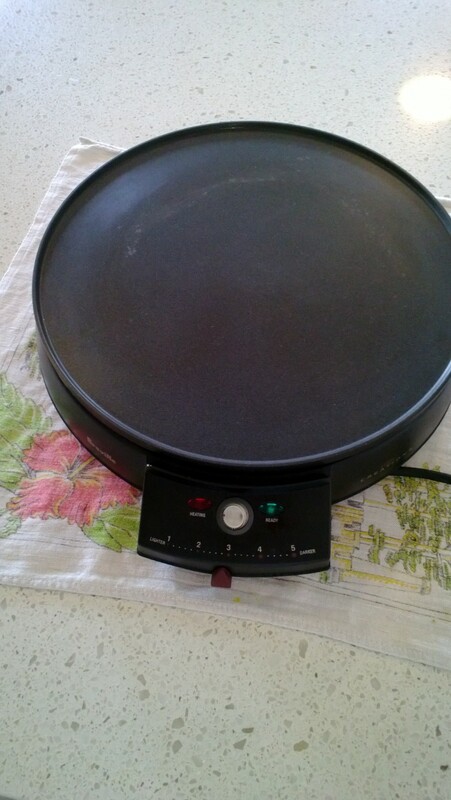 Every kitchen should have one, a crepe machine. Imagine my delight at being introduced to a stocked pantry and gourmet appliances in my sister’s house – Our home for an 8 week house sitting term. We have been instructed to use up foodstuffs, to avail ourselves of the facilities, but leave the treasured record collection alone. In return our tasks are to water an out of control garden, and walk an extremely well behaved dog. On one early morning walk out along the boundaries of Bribie Island National Park I find a Paw-paw – Papaya tree. A few unripe fruit have been victims of overnight strong winds, they come home with me. I can make Green Papaya Salad, a delicacy I encountered once at a Cooking class. Thank you Google for the recipe: I reflect that electronics has impacted on our use of books. Amongst products in my sister’s kitchen I can find fish sauce which usually draws the – ‘can I have mine without fish sauce’ comment from my husband. Rice wine, dried shallots, sweet soy sauce, chilies (another prohibited item) and sesame seeds. I cut loose in a frenzy of chopping and slicing. He can have the meat pie from Beefy Pies we didn’t eat yesterday. ‘I didn’t think you would like it.’ Unspoken is – because I know what is in here and its al; the things you don’t like me to use at home. ‘Of course.’ Again I am silently sure it will be instantly rejected. But nope! 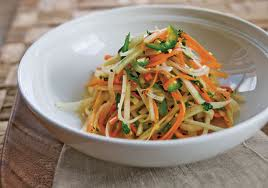 So next time I find green papaya there is to be two bowls of green papaya salad made. I might even be able to sneak some exotic spices, sauces and basic ingredients into the shopping trolley when we are done with our travels. Have I met the challenge of a distinctive voice by keeping this first person, but changing the boundaries?